"Lovina is a beach resort in northern Bali in Indonesia. The very mention of the word Bali to any traveller conjures up images of beaches, parties, paradise and alcohol. However here in Lovina, life takes on a slightly more relaxed mode, despite the fact that it�s a town that remains lively at night." 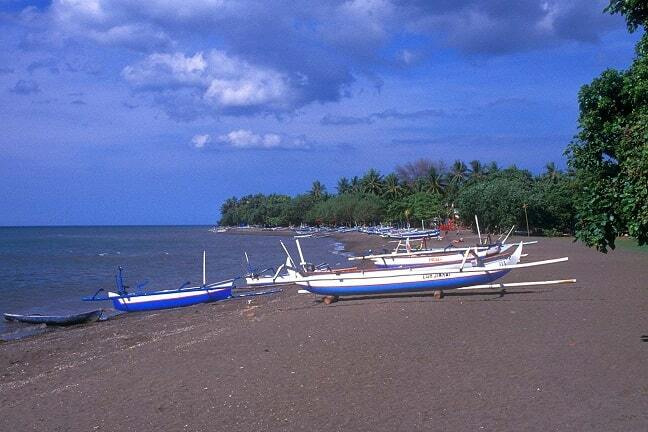 Lovina is a seaside resort with black volcanic sand located in the north of Bali at the Java Sea. It is usually quiet in Lovina, but, like the rest of Bali, there are many Australians in August. The rest of the year it is a wonderful break from the hustle and bustle of Kuta. The peaceful atmosphere, the calm sea, the black sand beaches and palm trees of Lovina knew already in the early days to charm the adventurers. Your visit to Lovina is especially for the beaches and despite the growth of various tourist facilities Lovina is a lot more quiet than the south of Bali. The place derives its name from a house, that was occupied by Panji Tisna, the regent of Buleleng and last king (raja) of northern Bali, who is also a published writer and a pioneer in tourism to Bali in the early fifties of the last century. His chosen name Lovina is a contraction of the words Love Indonesia. But INA can also refer to the Balinese word for mother, so "love mother earth". His villa in the village of Kalibukbuk is now no longer present, but a high outbuilding and high garden wall in Balinese style are still in good condition. It consists initially of a row of fishing villages along the northern road in Bali, under the influence of tourism they have grown together. Lovina is a collective name of the next village (east to west): Pemaron, Tukad Mungga, Anturan, Banyualit, Kalibukbuk, Kaliasem and Temukus. The area is drier than other parts of Bali, there is less wet rice, but there is more fruit (grapes), tobacco, coffee and clove plantations. In the seventies, when tourism flourished in Bali, Lovina was the only tourist destination in the north of the island. Lovina has a different feel than the south of Bali; slower, less neon, no surfers. This region is cheaper than the south. The government has laid out a sidewalk on both sides of the road in pink stones to indicate where Lovina begins and ends. It is a quiet resort with a beautiful beach and a diving area. There are restaurants, cafes, shops, dive shops and hotels. The tourist centre is located in the village Kalibubuk, where a beach promenade is. On the promenade is a monument topped by a dolphin. 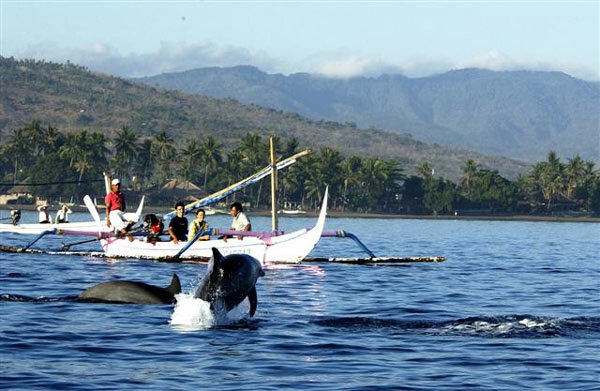 Lovina is known for its beach of black lava sand, and for its dolphins. These can be seen early morning in groups at the nearby reef. In contrast to the white southern beaches in Bali you can swim everywhere, because the stream is quiet. Along the coast there are also many coral reefs where you can snorkel, and it's excellent for swimming or diving. You can also easily go on a dolphin safari with one of the fishing boats. In Lovina you can go in the evening to several bars. There is often music played in bars and in some cases there is "live music" to enjoy. You can enjoy the evening sunset in the bars at the beach. There are all kinds of restaurants where you can dine well, but of course the seafood and traditional Balinese dishes are the highly recommended. In proportion here, the prices are average and therefore you have good food for little money. From the airport in Denpasar, where most tourists arrive, takes a taxi/ car about 90 minutes for the ride of about 90km to Lovina. The cost of a taxi is quite expensive and the amount will be about Rp 450,000. View dolphins, these trips depart each morning. Price ca. 5 �. Snorkeling and diving from Kalibukbuk Deer Island and other dive sites. There are several companies that arrange trips to eg Menjanan Island, Tulamben and Amed, as well as night diving events from the mainland. Spice Divers are located in Lovina and have daily trips to all dive sites in the north. Air Banjar Hot Springs west of Lovina, is a beautiful place with hot baths with carved stone fountains in a beautiful garden. Agung's Spa offers body scrubs, facials, massage, etc. 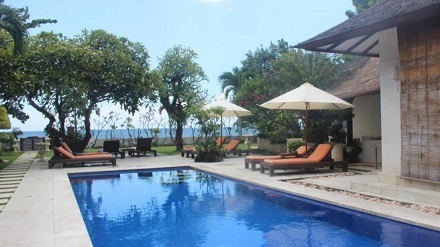 it is also the most beautiful spa in Lovina. Bali Samadhi Spa in Lovina has many types of massages. One of them is rebalancing massage. Spa Balinda for true Balinese massage, Cream Bath, Facial, manicure and pedicure. New, clean, professional. 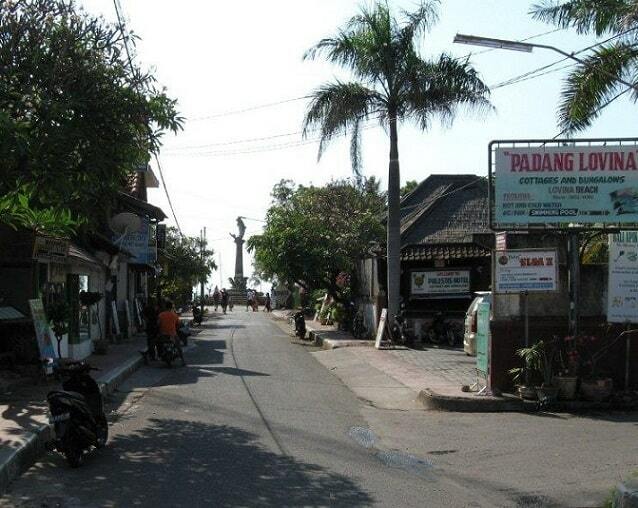 Within the area of Lovina, you can move easily. There are plenty bemos who regularly commute between villages. You can also hire a van for an excursion (or a moped or bicycle). Check in advance whether there are any defects. Whether you're a tourist or traveling on business, Frangipani Beach Hotel is a great choice for accommodation when visiting Bali. From here, guests can enjoy easy access to all that the lively city has to offer. Visitors to the hotel can take pleasure in touring the city's top attractions: Lovina Beach Monument, Lovina Beach, Yudha Mandala Tama Monument. The facilities and services provided by Frangipani Beach Hotel ensure a pleasant stay for guests. The hotel provides free Wi-Fi in all rooms, daily housekeeping, Wi-Fi in public areas, car park, room service to ensure our guests the greatest comfort. Hotel accommodations have been carefully appointed to the highest degree of comfort and convenience. In some of the rooms, guests can find television LCD/plasma screen, internet access � wireless (complimentary), non smoking rooms, air conditioning, desk. The hotel offers an excellent variety of recreational facilities, including canoe, outdoor pool, garden. Discover an engaging blend of professional service and a wide array of features at Frangipani Beach Hotel.